Transparency Spot and respond to non-compliance issues with real-time and historical reports, certificates, schematics and results in one location. Regulations Creates a full audit trail which supports organisations to comply with HSG274, ISO9001 and ISO14001. Schedule Schedule your tasks, manage failures or defects with site specific controls to manage any identified hazards. Paperless Record Keeping Storing historical data has traditionally meant a mountain of paper which can now be stored in the cloud making data accessible from any device 24/7. 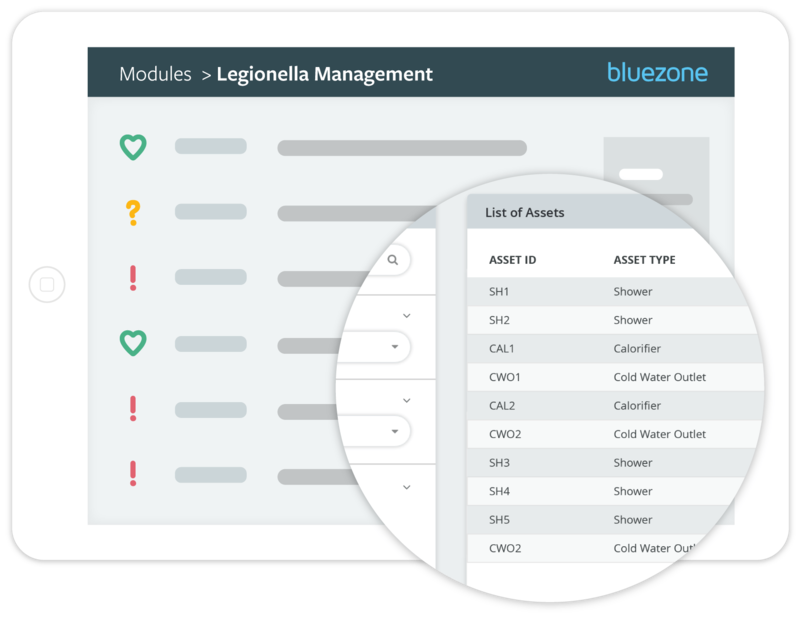 Ensure compliance of Legionella guidance by managing your water service companies and responsible person’s data including training records while ensuring the responsible people have knowledge of adequate procedures, are aware of remedial actions needed and by receiving alerts of corrective action. An asset register (including outlet register) syncs with the web-based log book to set up monitoring and inspection schedules. Receive automatic action alerts to carry out remedial actions and tracking of corrective actions.